I love coconut – from the juice to the flesh to the dessicated ones to the cream! I also love coconut in curries (from red to green to yellow to laksa), in rice like nasi lemak, and in desserts like kuihs, chendol, ice cream and in cakes! However, I don’t bake with them as they spoil very easily (excuses, excuses, excuses…). 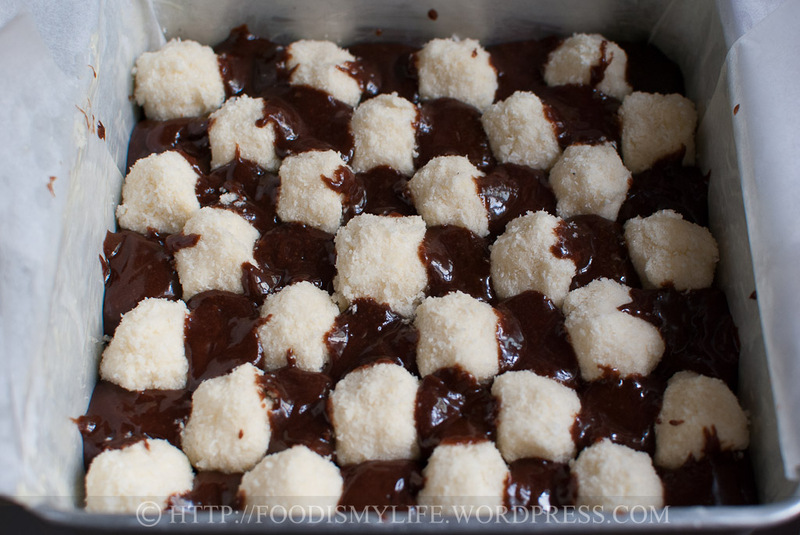 But with Bake-Along coming up with a Coconut Checkerboard Brownies I can procrastinate no longer! I absolutely love the brownies base – intensely chocolatey and gooey. 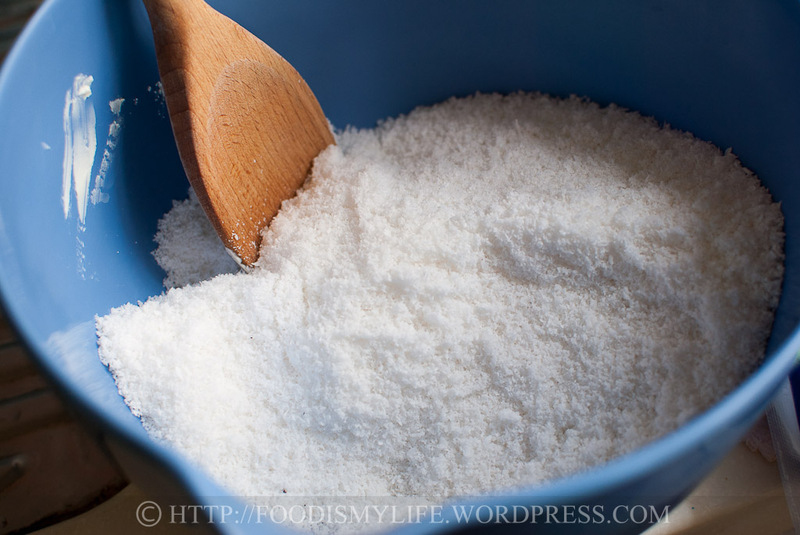 The coconut is a little too dry for my liking – I think the difference lies in the fact that the original recipe used fresh desiccated coconut (which is moister) while I used dried ones. Though it’s not explicitly stated in the recipe that fresh coconut should be used, I think that’s the main reason why the coconut portions are not moist enough. Nevertheless, the coconut smells extremely heavenly during baking and it’s an interesting twist to the traditional brownie. The checkerboard is definitely very lovely to look at, but it’s a little time consuming (having to refrigerate and spoon them separately), and to be honest, after cutting the brownies up, it’s hard to see the checkered pattern. 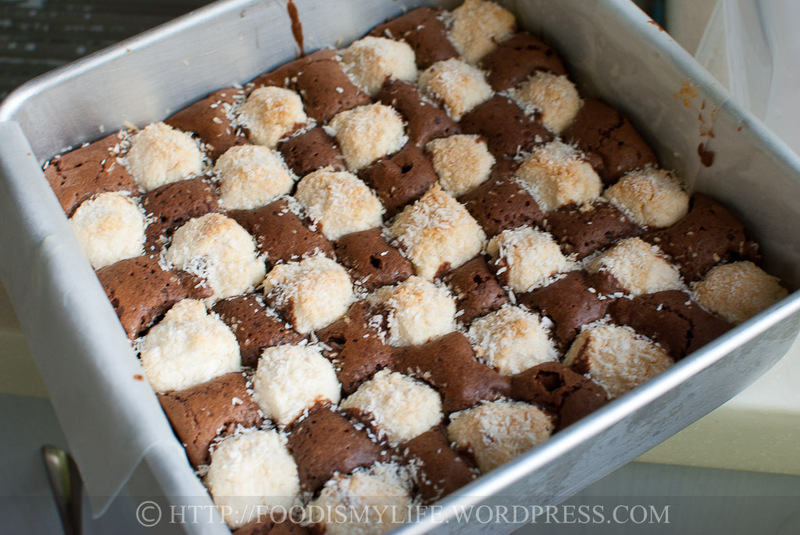 So the next time I make this, I would probably increase the amount of coconut cream and make the brownie into 3 layers – brownie, coconut and brownie again. It would be more even and easier to taste the coconut and brownie at the same time. 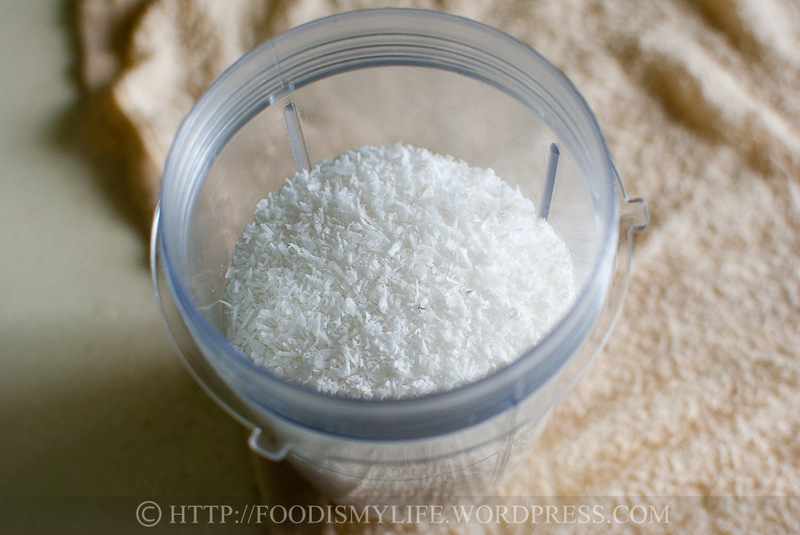 Coconut in a food processor – process till its finely chopped. 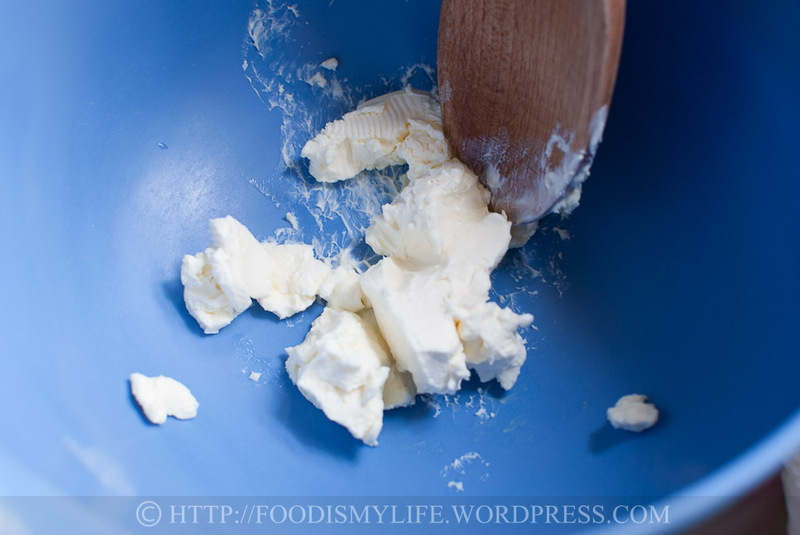 Weigh some softened cream cheese in a mixing bowl. Measure some cream of coconut. Add in the cream of coconut. Mix it around and get one egg and a pinch of salt in. 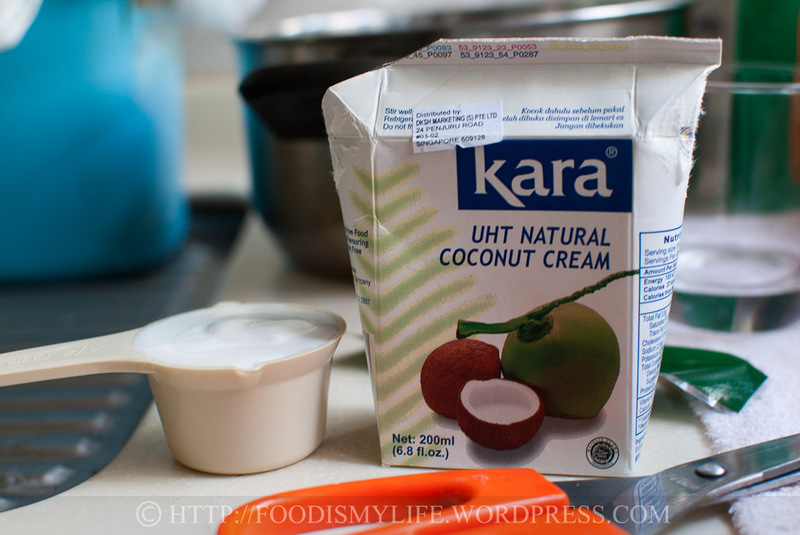 than this, so do add a little more cream of coconut if you have the same consistency as mine! 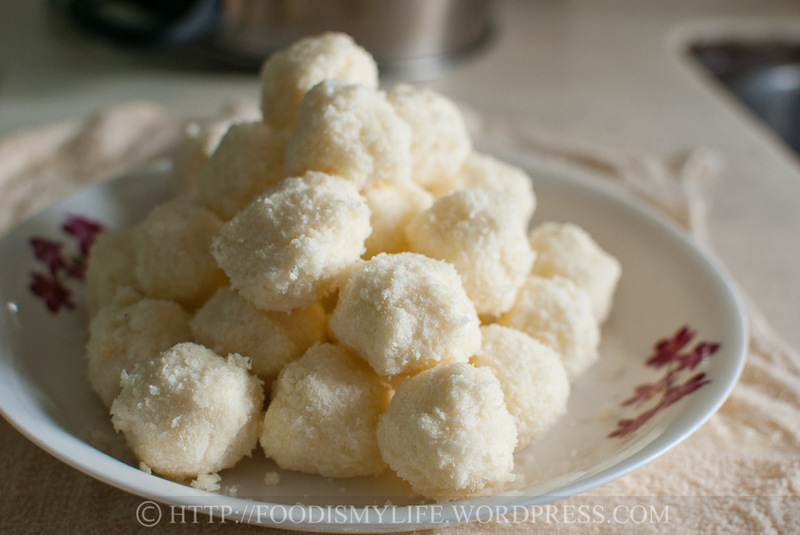 Refrigerate then roll into little balls like these. Combine some butter and chocolate in a heatproof bowl. 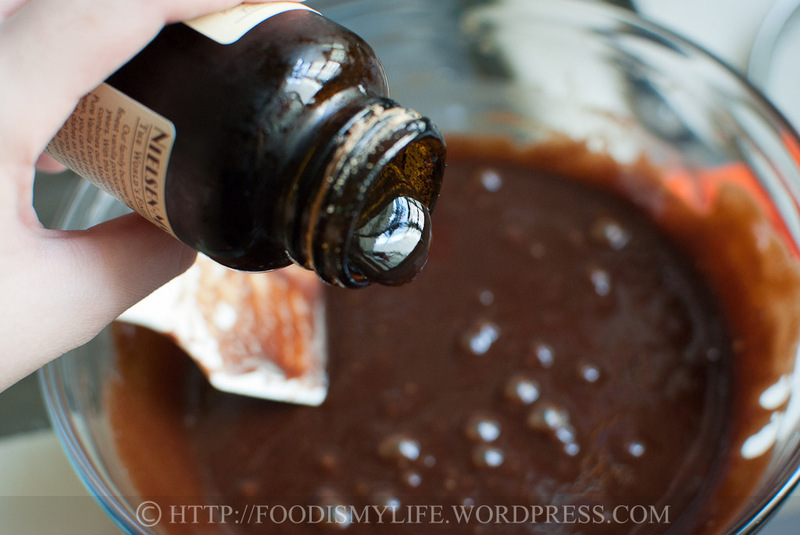 Melt into a smooth consistency over a pot of simmering water (double boiler). Add in sugar and stir. It will be lumpy, but will turn out ok later on (like magic!) Let the mixture cool slightly. Whisk in one egg at a time until fully incorporated – I beat them in using my rubber spatula (really lazy to grab my whisk). 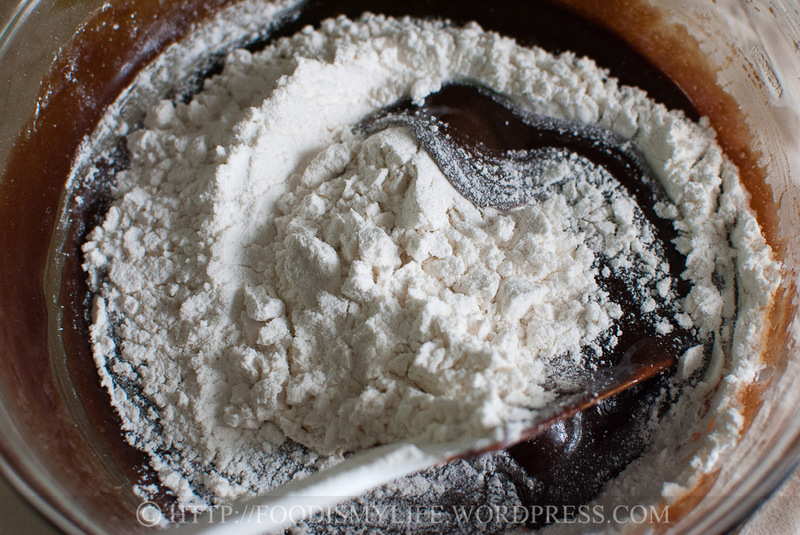 Sift flour, baking powder and salt over the chocolate mixture and fold it in. 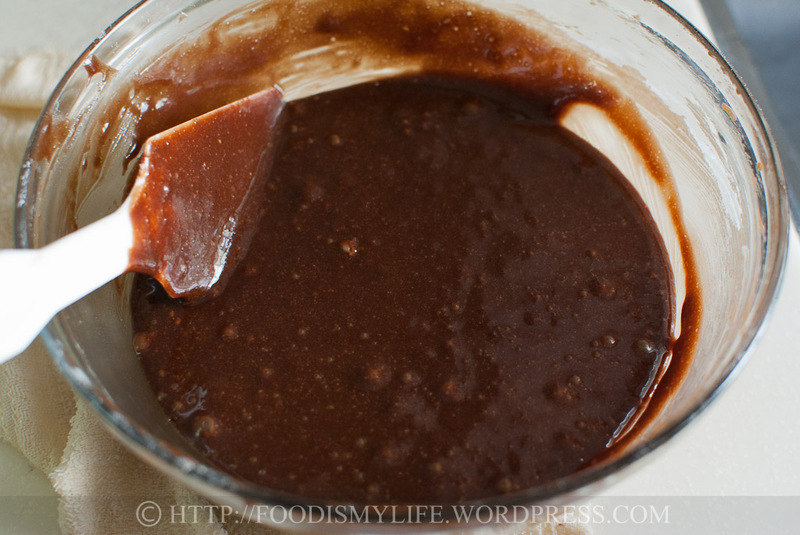 The luscious brownie batter! Spread some brownie batter at the bottom of the brownie pan then refrigerate both the brownie in the pan and the leftover till it’s thicker, but not firm. 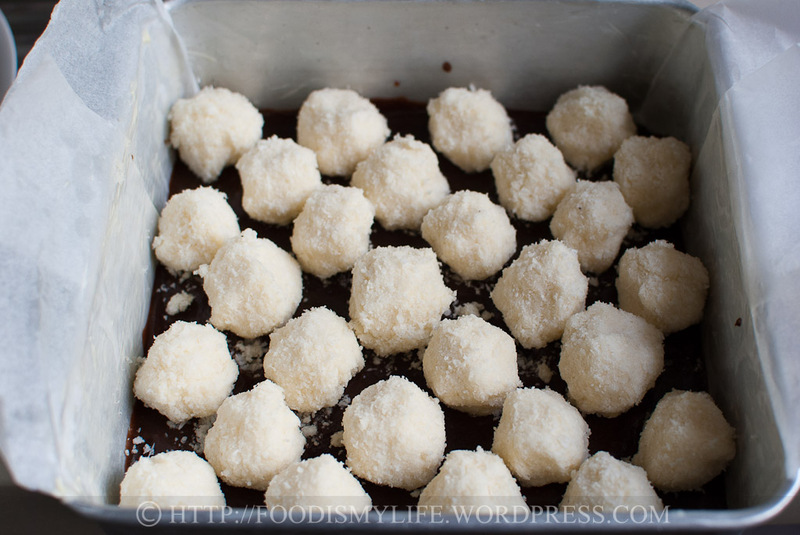 Arrange the coconut balls on the cold brownie base. Fill the little “holes” with the cold leftover brownie. Do hop over to the lovely hosts – Joyce from Kitchen Flavours, Lena from Frozen Wings and Zoe from Bake for Happy Kids – websites for their bakes for this Bake-Along! And to see what other bloggers have baked, do click the little froggie below! Butter an 8x8x2-inch metal baking pan. Measure ⅓ cup flaked coconut; cover and set aside. Place remaining coconut and sugar in processor and chop them finely. 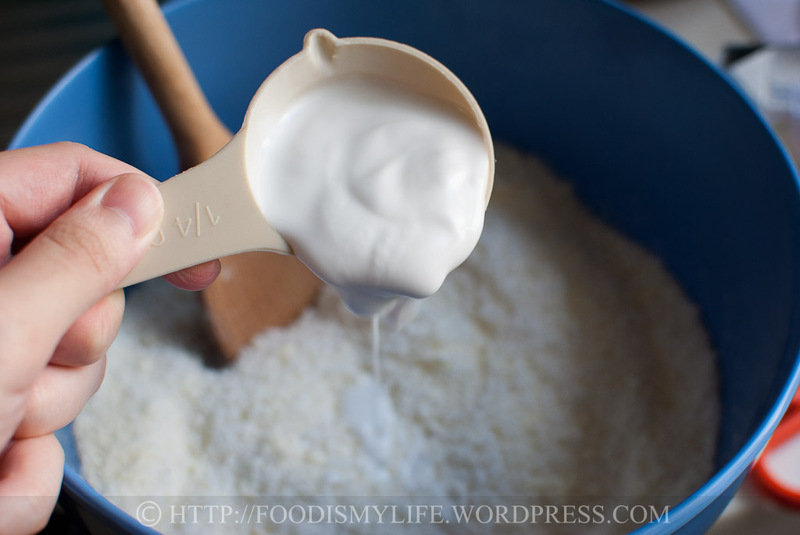 Place the cream cheese in a mixing bowl and add in the chopped coconut and cream of coconut. Stir, mash and mix them all up. 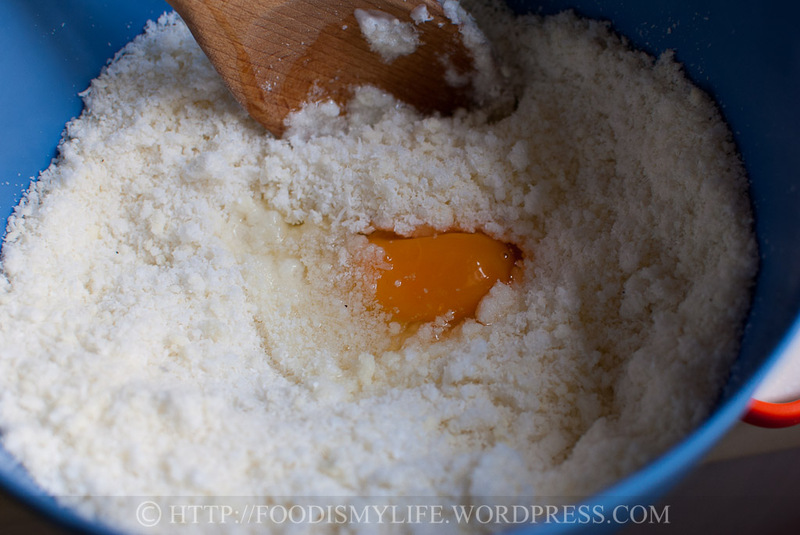 Add in egg and salt and mix well. Refrigerate till firm, about 1 hour. 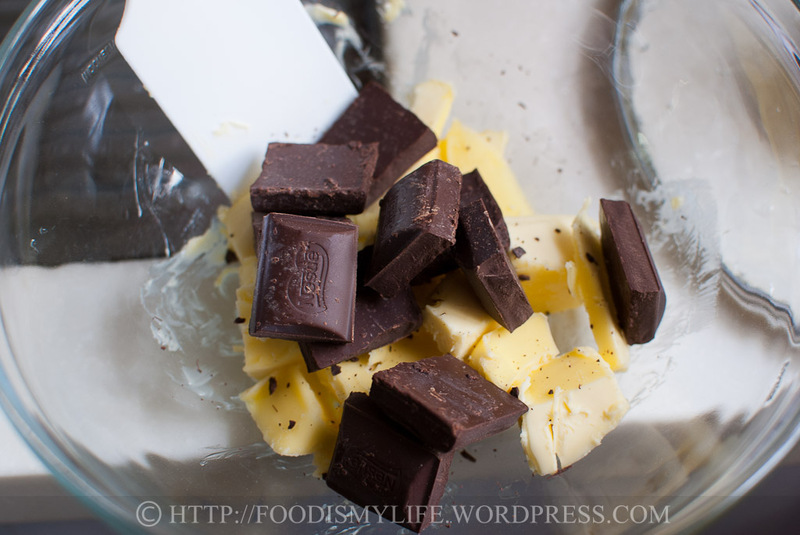 Place the butter and chocolate in a heatproof mixing bowl. Set the bowl over a small pot of simmering water (not allowing the water to touch the bottom of the bowl). 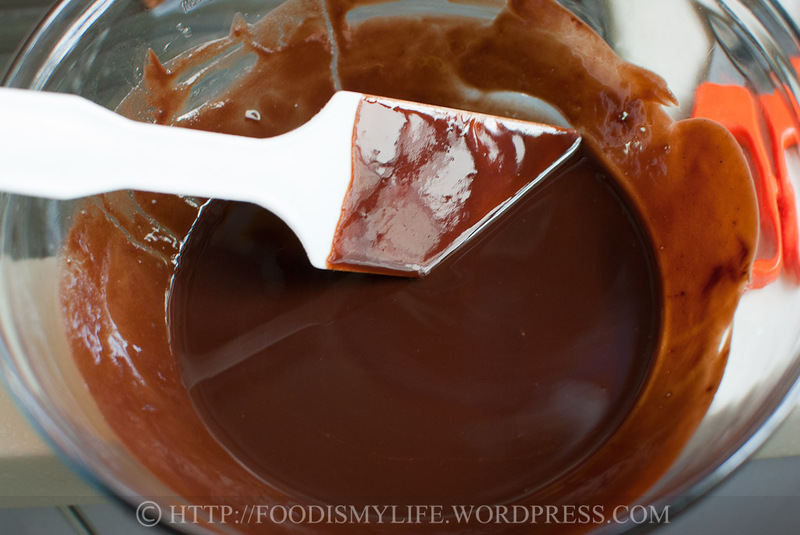 Melt the chocolate and butter completely, stirring occasionally till smooth. Remove from heat and stir in the sugar all at one go. It'll be lumpy but that's ok. Let cool for 10 to 15 minutes. Whisk in the eggs, one at a time, until fully incorporated. Whisk in the vanilla. 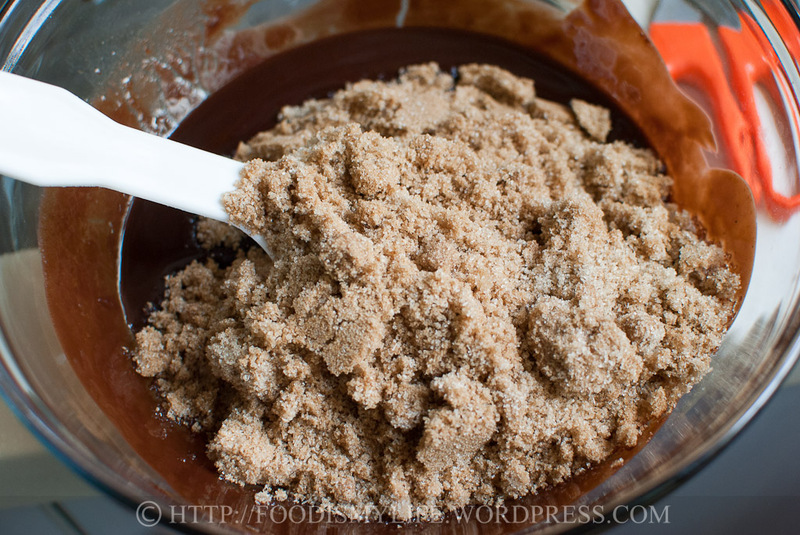 Sift in the flour, baking powder and salt over the chocolate mixture and fold it in with a large metal spoon / rubber spatula. Spread 1¼ cups of the batter on the bottom of the pan and spread it out evenly. Cover the pan with foil and refrigerate it together with the remaining batter till thickened, about 15 to 30 minutes. Preheat the oven to 150 degrees Celsius. 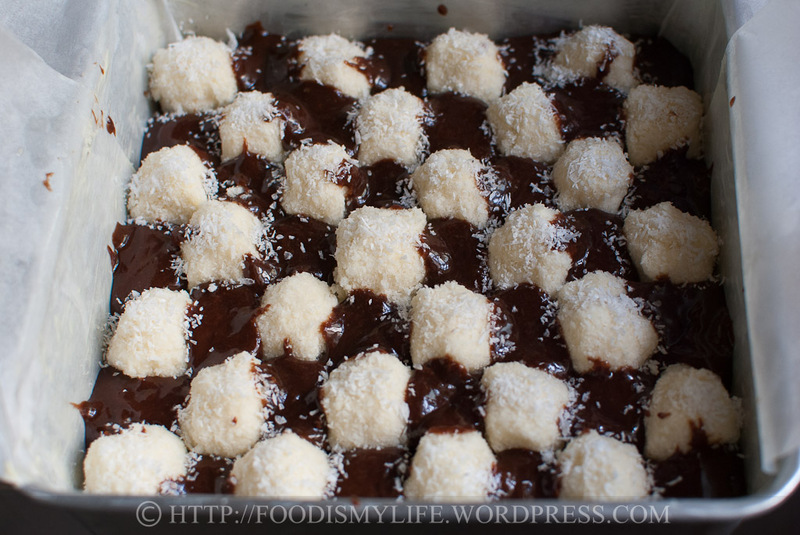 Roll the coconut batter into small balls and arrange them in a checkered pattern on the cold brownie base. Scoop the brownie mixture and fill the "holes". Sprinkle reserved ⅓ cup flaked coconut over coconut mounds; press gently to adhere. Cover pan tightly with foil. ah definitely..cream cheese and chocolate brownie will taste awesome! thanks for the great idea!! Thank you Jo! Hmmm why not substituting the coconut portion with cream cheese batter? 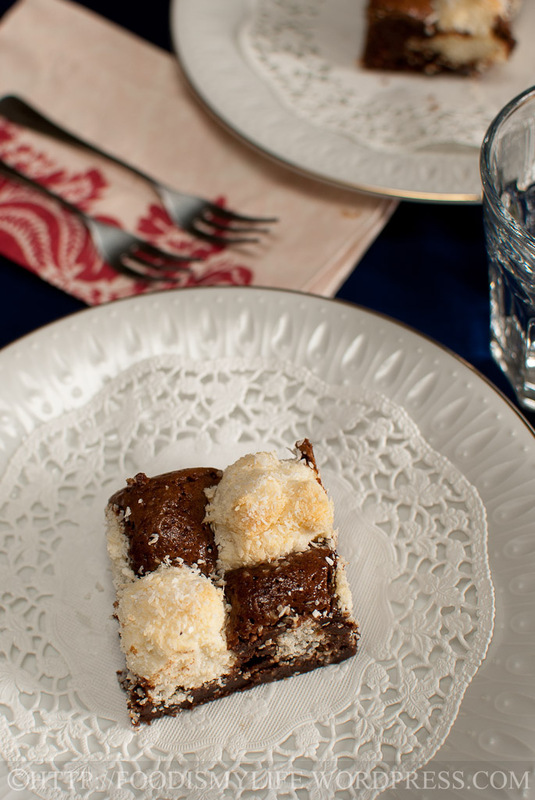 I’m sure a cream cheese-chocolate checkerboard brownie would taste delicious too! Thank you for the compliments Anuja! I only wish the coconut batter is softer, it would have made the brownie perfect! 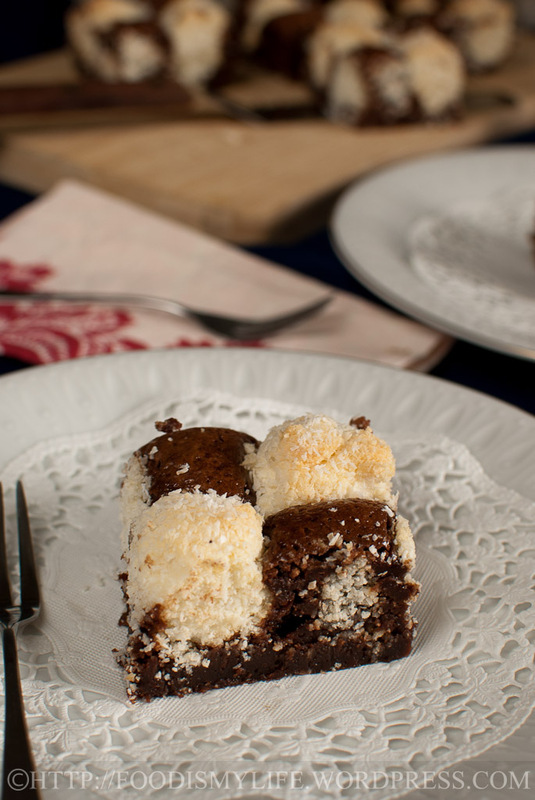 fantastic idea for a checkerboard brownie! the brownie looks absolutely gorgeous! such neat lines and cubes..I would love to make this, the only thing that is stopping me is that I’m not a huge fan of coconut especially desiccated coconut. By far yours is the best checkerboard brownies I have seen. Dont get me wrong, others’ did great too, but I liked your perfect checkerboard pattern. Mine didnt turn out good. It was too moist and soggy. Probably coz I used fresh coconut!! I will have to try it again coz its really bugging me that i didnt get it right :D.
will i need to add the sugar since kara is not sweetened? You have so much patience for perfection. Looks so yummy and very different with the coconut. I have to go to sleep before I have to whip up your coconut brownies to go along with Choc chip Uru’s rocky road icecream. hi jasline, reading your first paragraph seems to be describing me too!! coconut lover but strange enough, dont use that as much as in baking! YOur checkerboard brownies is perfect..a real checkerboard ..there didnt seem to be much gaps in between the white and the choc squares! i didnt find mine dry though..anyway i did a wrong conversion of the butter..maybe that’s one of the reason and i used flaked coconut. I think they are slightly different from dessicated coconut which appears to look more drier. Mine is like eating coconut candies..haha! Always a pleasure to have you joining us..i know you only bake during weekends! so thanks! Oh, Jasline!! It’s 17.00 here, perfect time for snack, and I so wish I had a big piece of that!! Jasline, what shall I say here. You are just one amazing baker.. 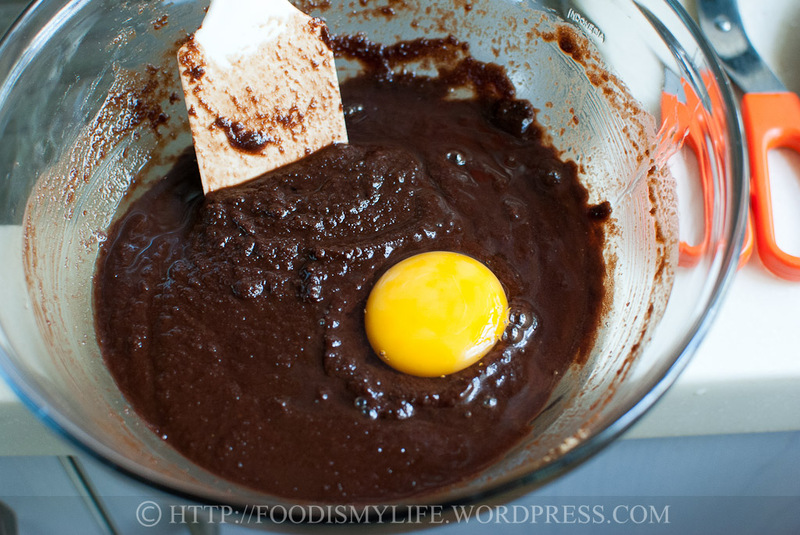 I like to see your steps of baking this checkerboard brownies…It is very pretty and neatly done. Beautiful, love your step by step with pictures. Checkerboard brownies? Absolutely beautiful my friend, you are amazing! These brownies look terrific and are so very far beyond my Neanderthal-like baking skills. I guess I’ll just have to wait for the arrival of that Care package you’re preparing for me. Delicious looking brownies. Great process photos, too! 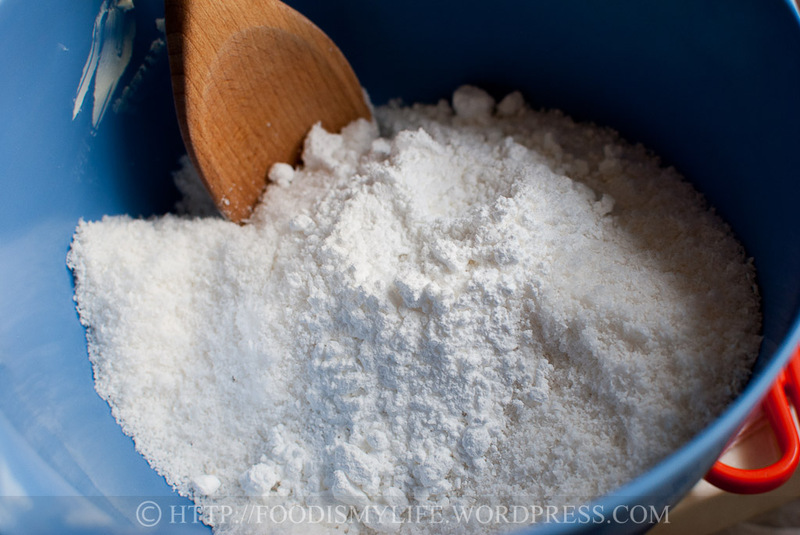 Hi Jasline, I also used the dried dessicated coconut. Can we get fresh ones here in Singapore? It seems very hard to find. 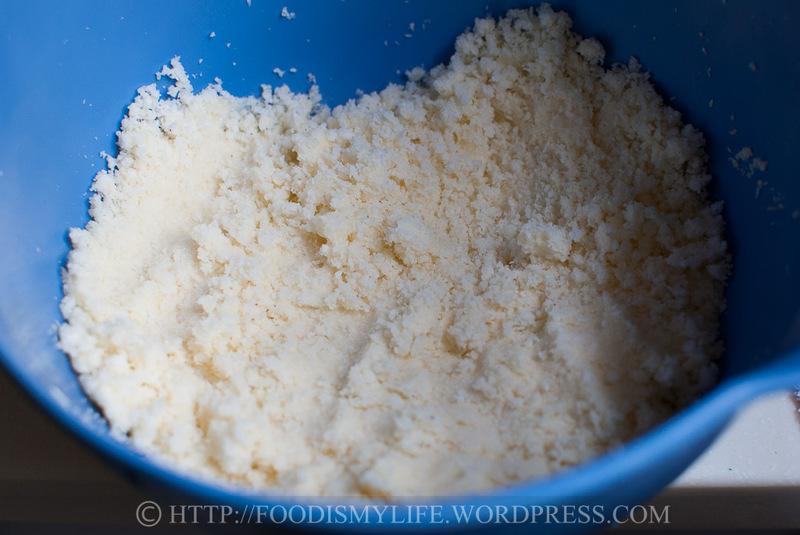 My coconut batter looked like yours – like cookies lol… you have a perfect checkerboard there. Beautiful. Bravo Jasline! Love the perfect checkerboard pattern of the brownies! Your bake seems so perfect… Totally agree with you… I like the fresh coconut more than the dessicated ones. Being Singaporean, my husband and I grew up eating lots of coconut too but strangely, the two of us like coconut in only in our savoury dishes and Asian desserts. Not in cakes and sweets… lucky that Joyce and Lena have agreed to allow me to transform my brownies to a non-coconut one. You did a very neat job of alternating the checks, and they look nice with mounted tops, mine was carelessly done! Thank you for baking along with us, have a great day!